UNITED NATIONS, Mar 18 2015 (IPS) - Nobel Peace Laureate Kailash Satyarthi has called for globalised human compassion to combat the global and persistent problems of child labour and child slavery. “We live in a globalised world, let us globalise human compassion, ” Satyarthi told an audience at the United Nations Tuesday. Satyarthi said that he was confident that he would see the end of child servitude in his lifetime but emphasised that everybody had a moral responsibility to address the issue. Child labour still remains a truly global problem hurting millions of children worldwide. Worldwide more than half of all child labourers work in agriculture, including in the United States where Human Rights Watch reports children working on tobacco farms are exposed to nicotine poisoning. In total, the International Labor Organization reports that there are 168 million children in child labour, and that more than half of them, 85 million, are in hazardous work. Satyarthi also expressed concern that while progress has been made on child labour, the more heinous crime of child slavery has stagnated. 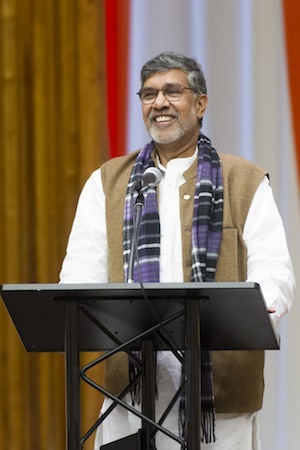 Satyarthi said that the United Nations played a key role in addressing child labour. He emphasised that there needed to be clear language on tackling child labour in the Sustainable Development Goals (SDGs). He also called for greater cooperation between organisations working to protect children to ensure a holistic strategy. “By empowering families socially and economically and building their resilience to recognise child slavery, and being aware of their rights and how to exercise them, we can deliver a first strong blow against slavery,” she said.